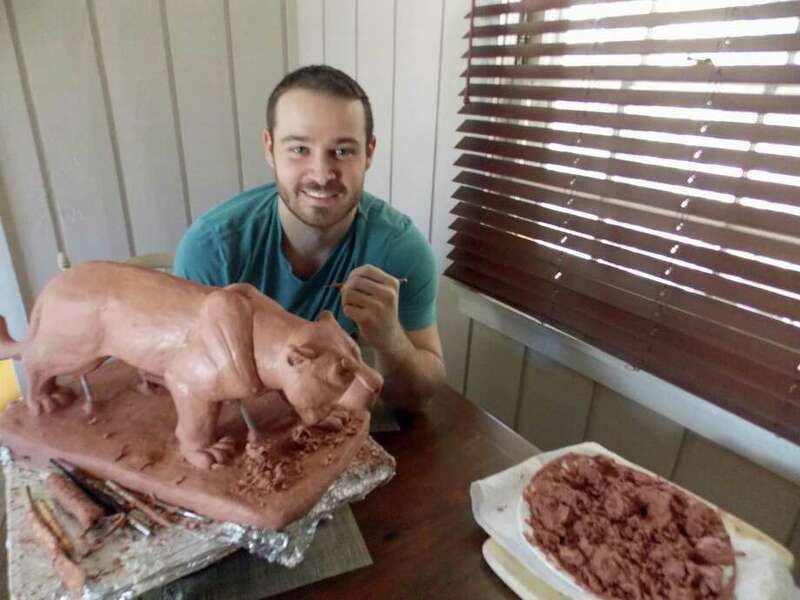 Jesse Nusbaum works on his current project, a panther sculpture, at his Westport home on Feb. 5. WESTON — Growing up in Weston, Jesse Nusbaum always had a passion for art and animals. The 29-year-old would later combine these two interests into a career, becoming one of the youngest members ever inducted into the Silvermine Guild of Artists in New Canaan. Nusbaum’s bronze animal sculptures have been featured in exhibitions across the country, including Connecticut, New York, Pennsylvania and Florida, and his Husky sculptures are on display in the University of Connecticut men’s and women’s basketball trophy cases. World Wide Art Books has selected Nusbaum’s work to appear in its “Important World Artists” and “International Contemporary Masters” publications this year. Nusbaum additionally maintains a professional studio in Weston which opened in 2014. Though finding early success in art sphere, it took Nusbaum years before deciding to pursue his dream. Originally a political science major and baseball player at Muhlenberg College in Pennsylvania, his plan was to attend law school and then join his father’s law firm in Westport. Scheduling conflicts soon forced him to switch to a more flexible major — he chose fine arts. “I took a couple of sculpting class, fell back in love with it, and reignitied the fire I had within me that I definitely missed for a year,” he said. After graduation, he went to law school but concluded it was not his passion. The choice appears to continuously pay off, with Nusbaum most recently named to Connecticut Magazine’s “40 Under 40” list for 2019. His work will also be displayed at Red Dot Art Basel in Miami in December and Artexpo New York in April 2020. Nusbaum recently spoke about his current project and reflected on his journey as an artist. Q: How did you get your start in sculpting? A: At a young age, I always had a knack for it. I felt that compared to my peers at a young age, it just came to me more naturally, a little more easily, so I found great satsfaction out of getting my work done, being very pleased with it, and in turn helping out my friends. ... I love drawing, painting, all the arts, but sculpting really spoke to me the most. I really like the idea of creating something in your mind or a picture or a two-dimensional object and being able to recreate it in a three-dimensional finished piece. Q: Any particular designs you enjoy creating? A: Animals that are finished and cast in 100 percent bronze. My theme really is as a simple as realism and animals cast in bronze. Q: Have you always been artistic and wanted a career in the arts? A: I was always artisitc for sure. ... But I never saw it as a true career or something that was attainable. The goal was always to go to law school and be a lawyer. ... I kind of just put everthing else — baseball, all that — all on the backburner and focused on the fact that I was going to law school and was going to become a lawyer. Q: What is your current project? How are people notified about what you’re working on? A: Right now I’m doing a panther. ... Three years ago, before the (Instagram) algorithm came into play, it was a lot easier to gain followers, gain momentum and reach a larger augidence. So I amassed 85,000 followers within about a year or year and a half. And since then I’ve dropped about 20,000. I don’t post that often, so I know that’s a factor, but also the algorithm. We did a test and it only reaches 6 percent of my followers. ... But initially in the beginning that’s how I was getting most of my sales. And then from there it was showcasing them at different galleries, different juried exhibitions, and then people would buy them from there. Then I found representation in Florida — Zenith Art & Fashion — and they repped me down South. They had a very strong PR team, so we get reps all across the country, and I also made some international sales through Instagram. Right now they are repping the South, and we’re moving out West, and then we’re going to go up the Northeast. Q: Why did you pick Weston for a studio? A: I need to feel connected with nature. I need to see foliage. I need to see animals. I need to see deer and rabbits running through my backyard. All my friends live in the city, and I cant be there more than a day. It’s a concrete jungle, I don’t like it. I could say I’m one of those people that jokingly says I love animals more than people. ... I just love being surrounded by nature and animals, and the things that make me happy and keep me inspired and motivated. Q: What was your reaction to getting picked for “40 Under 40”? A: The process was about almost a year long — that’s when I started applying and sending my accolades as they were coming along. Toward the end, once I started getting more accolades and being recognized for my work ... I felt that I had a very good chance. It happened very quickly toward the end, and I think if i didn’t get that large push at the end then I probably wouldnt have been selected. ... I had a good feeling I was in the running, but I definitely was pleasantly surprised when I found out that I got it. Q: Did you expect your art to become as popular as it is now? A: I’m a competitor, so it’s always what I wanted. That’s always what I dreamed of, but not at this level. I never thought I’d be published in a book. Never in a million years did I think I’d ever be published for my artwork, and I never thought I’d be able to make a true career out of it. I never really gave it the proper amount of time and wasn’t realistic about it. Somebody could say it’s unrealistic to try and make a career out of your artwork, but on the other hand, I knew that this was absolutely my calling, it was absolutely my passion. ... I thought if i kept pushing that I can make it onto something.